These Highfields accredited first aid courses are designed to give you the skills, knowledge and competence required to administer emergency first aid in the workplace. This includes being able to assess, diagnose and treat casualties before the arrival of medical staff in the event of an emergeny. Courses are delivered by our experienced tutors, who are practical and hands-on in their approach. Training will take pace in our Academy of Sport, which has recently undergone £1 million of investment. First Aid training should be risk-specific so please contact us if you would like to discuss a training package based on your specific requirements. First aid at work certificate; valid for three years. For best practice we support the HSE recommendation to complete an annual update of your first aid skills. Our courses are renowned for providing a quality learning experience offering hands-on practical training skills that leave first aiders feeling confident to use their skills in a real life situation. It is therefore important that participants are physically able to perform the relevant actions and techniques included in the HSE syllabus. 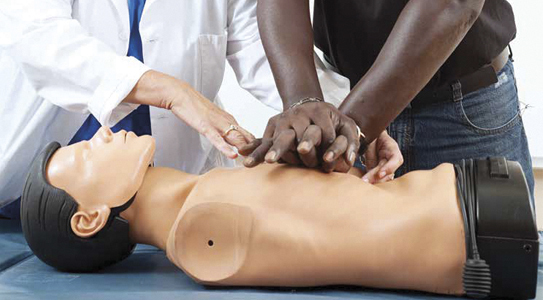 You must send a copy of your valid First Aid certificate to coachingcourses@lsbu.ac.uk. Courses are £175 per person.